It was Thomas also who asked Jesus what on earth he was talking about when he said he was going to 'prepare a place for them.' We are fortunate that Thomas voices the questions which we all have and in so doing shows us that it is alright to have doubts ands fears in our faith. Like Thomas we do not know what happens when we die, we are filled with questions. But thankfully this is a good thing, faith is like a muscle it grows by stretching. It is good for our faith to be stretched like Thomas and as it is we learn to understand that there many things which we just do not and never will understand. John to the seven churches that are in Asia: Grace to you and peace from him who is and who was and who is to come, and from the seven spirits who are before his throne, and from Jesus Christ, the faithful witness, the firstborn of the dead, and the ruler of the kings of the earth. To him who loves us and freed us from our sins by his blood, and made us to be a kingdom, priests serving his God and Father, to him be glory and dominion for ever and ever. Amen. "We share one human story in which we are all caught up in one sad tangle of selfishness and fear and so on. But God has entered that human story; he has lived a life of divine and unconditional life in a human life of flesh and blood." "He said 'I want you to bless us; I need to say in public that we were responsible as well as the people on the islands…' Here was a politician representing a community that had suffered greatly and inflicted great suffering as well saying 'We were all wrong. We needed healing and forgiveness…' And it was as if for the first time you could see the bare bones of what reconciliation means." "…going forward requires us all to learn a measure of openness to discovering things about ourselves we did not know, seeing ourselves through the eyes of another. What they see may be fair or unfair, but it is a reality that has been driving someone's reactions and decisions. We'd better listen, hateful and humiliating though it may be for some of us." "Everyone in this history made decisions, some shockingly evil, some tragic, some foolish [but] those decisions and the sufferings that came from them don't have the power to tell you what decisions you have to make today." "If we can accept the unwelcome picture of us and our world that Good Friday offers, we are in the strangest way, set free to hear what Easter says. Give up the struggle to be innocent and the hope that God will proclaim that you were right and everyone else wrong. Simply ask for whatever healing it is that you need, whatever grace and hope you need to be free, then step towards your neighbour; Easter reveals a God who is ready to give you that grace and to walk with you." "When in our world we are faced with the terrible deadlocks of mutual hatred and suspicion, with rival stories of suffering and atrocity, we have to pray for this resurrection message to be heard." The experience of Resurrection results not simply in a good feeling but in the transformation or renewal of our life and action. Resurrection is not just about some future day after we die. It is also about the world today--the world of objects, people, creation, and beauty; the world that experiences both sin and evil as well as justice and peace; the world with all its struggles and its possibilities. If we believe in Resurrection then we should expect to see some signs of it. Community is formed. Fear is dispelled. Reconciliation becomes real. The work of justice and peace takes place. Society is transformed. There is a new heaven and a new earth. John receives a call to write down the message and share it. A growing community gathers in Solomon's portico. Signs and wonders occur in the early church. Thomas and later a great number of people come to faith. "Bad spirits" are driven out. The message is "Do not be afraid," and "Peace be with you." Spirit is given for the forgiveness of sin. What signs and wonders do we see today? What signs of faith expressed in deeds? What signs of the forgiveness of sin? What signs of the forgiveness of social sin? What signs of reconciliation between peoples and nations? What signs of work for justice and peace? Through every minute of this day, be with me, Lord! Through every day of all this week, be with me, Lord! Through every week of all this year, be with me, Lord! be threaded on a golden cord. By grace I may, at last, Be with thee, Lord. Faithful God, strength of all those who believe and the hope of those who doubt; may we, who have not seen, have faith and receive the fullness of Christ’s blessing; who is alive and reigns with you, in the unity of the Holy Spirit, one God, now and for ever. Amen. This week sees the beginning of a very unusual series in our lectionary - there are no Old Testament lessons, only three readings from the New Testament, and this week's trio deal in some way with faith. One of last Sunday's newspapers carried the interesting statistic that 49% of young people do not believe in Jesus Christ. That poses an interesting question about belief. If it is being suggested that Jesus Christ did not exist, such a notion is foolish. There is more evidence, and not just from the gospels that He did than, for example, the suggestion that Julius Caesar visited Britain, where the only account is his own. We are prone to accept easily all sorts of incredible facts (Did you know that penguins all fall over backwards when a plane flies overhead?) with minimal evidence so we need have no fear of seeming foolish if we believe in Jesus in that sense. What is a more difficult question of belief is to consider the nature of His life and work, and especially His resurrection for which there is no direct proof, or rather because of the unusual nature of the event we require something different by way of proof. All the gospel writers do their best to give this reassurance. Luke with his stories, including the well known account of the road to Emmaus. And John's account emphasises that Jesus' body is still recognisably the same body, and is susceptible to touch by Thomas, but that it is at the same time different insofar as He seems to be able to come and go at will untrammeled by normal earthly limitations. It is comforting perhaps to notice that Jesus did not condemn Thomas for wanting proof. That means, I believe, that we do not have to worry ourselves sick because we find that from time to time we doubt. 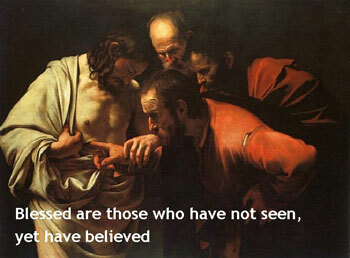 Doubt is part of the human condition which Jesus recognised and accepted. Thomas' response "My Lord and My God" represents a supreme statement of faith - and is one of the very few times in the gospels when Jesus is referred to as "God". And what Thomas recognised is that in Jesus we have one "picture" of God, the crucified God, vulnerable, involved, self giving and present in our difficulties and pain. But Jesus was aware that Thomas had a privileged place, and that we who come after must find faith without being able to touch and see and hear Jesus as he could. But we are not left entirely without aids to our faith. It would have been easy enough for the powers of the day to have killed off Christianity by finding the body - but they did not, and they were in no position to counter the claims made by Peter and the other disciples. Then there is the change of attitude in the disciples themselves. We look forward now to the rejoicing at Pentecost, and what bigger contrast could there be between the bold approach to the crowds in Jerusalem and the "disciples together behind locked doors for fear of the Jews"? The episode recorded in the Acts carries on that story. Not only have Peter and John put aside their fear, they are bold enough to beard the very group who were responsible for Jesus' crucifixion in their Council. And again, as far as the record shows the Council could do little about it. Whatever happened on that first Easter Day had the most profound and lasting effect on that small group. And on it went. The tenor of John's words in that first chapter of Revelation is incredible! Reflect that he was writing to small, vulnerable, tiny, divided, tempted congregations set as minute islands in the sea of the vast powerful Roman empire. God's eternity, His presence in the Spirit with his churches, His victory over death and evil through the resurrection of Jesus, His absolute authority over all earthly powers, the promise that Jesus' followers will share in His reign, and the assurance that the final outcome is not in doubt, all this is powerfully affirmed. As we get older, we tend to know what we think and stick to it! This is a good thing, if certainty is based on wisdom and experience. It is a bad thing if certainty is based on prejudice and a jumble of lazily acquired beliefs. The example of Thomas reminds us of the importance of thinking for ourselves and for reappraising familiar ideas. In this week, we could set ourselves the challenge of asking “why do I think that? Why do I believe that?” The issue you are thinking about could be on a wide scale to do with politics, social affairs, race. Or it could be to do with long-held views on a person or people. Set yourself the test. You may find, like Thomas, that your mind is changed and your life improved. 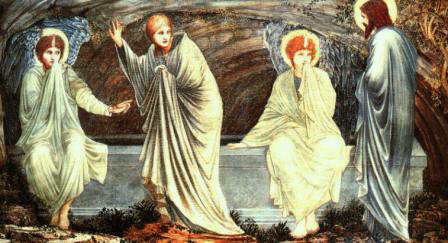 Risen Lord Jesus, you come to us in the most surprising - and the most ordinary - ways. Just when we begin to forget or doubt you, when we begin to live our lives as if you don't matter, you come - speaking to us, feeding us, encouraging us. You never forget us or fail us. Without you we are weak and fail often but with you we are strong. May we be made deeply aware of your presence this day. Come into our hearts Lord Jesus, show us the sin which lies there. Come and judge us, for your judgement is the same as your love and we have nothing to fear. As you remind us of pour sin, so you will forgive. Heal us and give us the confidence to begin all over again, witnesses to your power and grace in the world. In the strength of your grace we pray "Come Lord Jesus, Come". O God, Creator, Redeemer and Sanctifier, we thank you that we may be together to hear your word of life and hope. We are all equal before you. You know our lives in their deepest recesses. You have not forgotten us; you love us, and again and again you fill the empty hands which we stretch out toward you. Through the suffering and death of your Son Jesus Christ, you took our darkness and fear upon yourself in order that we might know light and joy. Amen. Lord, remind us that we must "be" the church if we are to "be the church" in mission. Help us to continue to grow in the likeness of Christ by the empowering presence of the Holy Spirit. Only by continued growth in him can we be released for mission to the lost, the poor, the broken. We would be instruments, O God, of extending the ministry of Jesus and his kingdom for your good pleasure. To serve you all our days is our hearts' fervent desire. Amen. on this holy Easter morn. 3	Christ is risen, we are risen! Life for all men, alleluia!